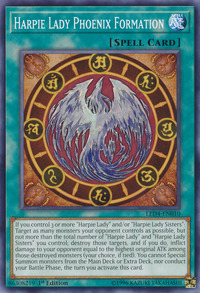 This card has an anime-only counterpart: Harpie Lady Sparrow Formation. This card, Harpie's Feather Duster, Harpie's Pet Dragon and Harpie's Feather Storm are the only Harpie cards related that haven't been censored in the TCG. They are also the only ones to not be/feature a Harpie. The card text your choice, if tied is redundant, as the same amount of damage is inflicted, regardless of choice.